It’s been almost a month since Olixar unveiled how P30 and P30 Pro look from the rear. Now another case maker named Spigen has confirmed the information and unveiled that front of both devices as well. Spigen has posted 5 different cases of P30 and P30 Pro – showing that P30 Pro will be backed by 4 rear cameras in a vertical fashion – partnered with a Dual LED Flash on the right corner of the handset. The P30 looks identical with three rear cameras – placed vertically along with an LED Flash which is positioned horizontally below the camera lenses. 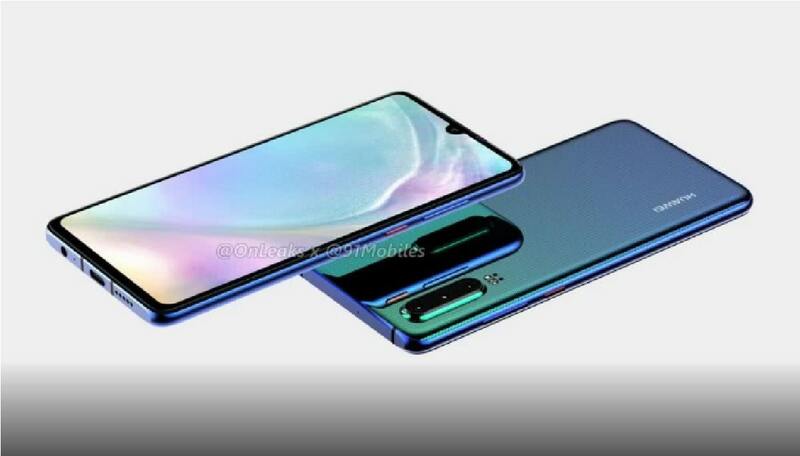 Back in December, a render shown a handset with a front which was borrowed by an Oppo smartphone. Now, it seems that Spigen is showcasing a real deal. It’s showing slimmest bottom bezel, a waterdrop-like notch which we have already seen in Huawei Mate 20X. Well, the other three sides of the handset have none whatsoever. The most interesting part is that the front is pictured with an official release date which is March 28th, 2019. Yesterday on Poland, business plans unveiled Huawei P30 series which will be launched in Paris before March ends. Thus, it’s most likely that we are looking at the real launch date (March 28th). Last year’s flagship smartphone “Huawei P20” released in a French capital – therefore, it’s unlikely to see its successor sooner than that. Huawei has all set to have an announcement at Mobile World Congress (MWC) 2019 and it seems like P30 and P30 will be unveiled alongside a foldable and 5G-enabled smartphone.